Could we use electromagnets to draw it out of the Martian air? I know the iron will become magnetised as a result, but would switching them off be enough to drop the dust from the magnets? The dust will become magnetised itself. You can switch off electromagnets, but their cores retain a little residual magnetism. The permanent magnet parts cannot be switched off. It's just down to careful design to prevent dust from building up and causing overheating, wear or jams. That's part of why I want to use a heavy tracked vehicle along the lines of the Japanese Type 60 106mm recoilless rifle carrier. The Mars variant wouldn't have weaponry or a Diesel engine, but much like the original it has large thick metal plates to radiate away heat. The resultant vehicle would be about 4 feet high at the top of the cargo compartment, 7 feet wide, 14 feet long, and is intended to carry two suited crew members wearing MCP suits. The vehicle's gross mass would be about 4,000kg, but it would only weigh approximately 1,500kg on Mars in .38g. The rolling resistance of a tracked vehicle is greater than a wheeled vehicle, but has superb traction and gradient climbing capabilities and operates at or below 50kph to reduce crew fatigue and reduce the effects of collisions with terrain or other vehicles. Instead of the steel plate armor used by the Type 60, the hull would be fabricated from 5083 Aluminum alloy plate. 5083's first use was for cryogenic liquid storage, but the hull of the M113 armored personnel carrier is also constructed of 5083 plate. The tracks could be NanoSonic's low-Tg shape memory metal rubber or high grade stainless steel forgings with shape memory metal rubber track pads. The NanoSonic rubber was designed for NASA for soft cryogen storage and is a very tough metallic rubber compound that attenuates radiation from GCR's. The road wheels would be UHMWPE with NanoSonic rubber contact surfaces. The drive sprockets would be UHMWPE if rubber tracks are used or stainless steel if stainless steel tracks are used. A torsion bar suspension system will soak up the bumps in the terrain. A pair of direct drive 11kW (240V, 46A at full draw) high efficiency brushless DC electric motors in aluminum housings provide motive power to the vehicle and BHP/tonne is very slightly better the original Type 60, so performance should be very similar. These motors are totally sealed and transmit heat from operation through the motor housing to the glacis plate of the vehicle using a thermally conductive paste. The glacis plate is a large metal plate that runs the width of the vehicle and serves as both a radiator for the electric motors and as a stepping board for astronauts to use to enter or exit the vehicle via a pair of top hatches. The crew compartment of the vehicle has a non-structural HDPE or BNNT liner to attenuate radiation from SPE's and GCR's, just like a tank that's been outfitted for radiological environments. It would be pressurized to provide a shirt sleeve environment, but the crew would wear MCP suits to enter and exit the vehicle. The glacis plate is between 2 and 3 feet high. The crew compartment uses a heat pipe and blower system to radiate heat via the heat exchange side plates of the crew compartment. The seats are manually adjustable and constructed of a bungee suspended durable mesh fabric. The crew can travel fully suited with their heads out of the top hatches or use transparent ceramic armored vision blocks if they want to remove their helmets. If visibility conditions are poor, a 360 degree multi-spectral camera system is provided for low visibility operations. The crew uses iPad mini flat panel displays mounted to what would normally be the vehicle's dash panel. The advantage is that there is no wiring for multiple instruments, no specialized instrumentation parts, and if a display dies for any reason, then backup displays are available. Each astronaut carries a pair of iPad minis in an instrumentation pouch. The battery compartment is external to the vehicle, accessible from the top, and located just behind the pressurized crew compartment. An alternative location for better CG would be the bed of the cargo compartment, but then a minimum of 9" of cargo space are given up. The battery packs are removable 10kWh modules similar in appearance to those that power the Nissan Leaf. Each 10kWh pack has a mass of 80kg and weighs 30kg on Mars. The battery pack's cell dimensions are 9" x 12" x 28". A fully equipped vehicle contains 9 battery packs providing ~90kWh and weighing 270kg on Mars. The electric motors operate at 240V, so a minimum of 3 functional packs are required to operate the vehicle. The intended operational radius is approximately 100km, equating to 4 hours of total driving time at top speed. For pack removal, a suited astronaut stands atop the vehicle, straddles the battery compartment by standing on the crew compartment hatch and cargo compartment, both of which are at the same height, twists 90 degrees and then pulls straight up on the battery pack handle to actuate a quick release locking mechanism to remove individual packs for testing / cleaning / recharging, but the charging ports are on top of the individual packs so removal is not required to recharge them. The packs also use conduction to transmit heat to the large side and top plates of the vehicle. The removable pack concept is important to sharing a pool of packs amongst crewed rovers, remotely operated regolith collection rovers, remotely operated scientific rovers, and remote scientific equipment stations, and portable charging stations that use Orbital ATK's MegaFlex arrays for recharging. The packs contain resistive heating elements for low temperature survival and cell wear leveling electronics to improve the operating life of the pack. The rear ramp is just 14" above the ground, the cargo box is approximately 32" high, 60" wide, and 96" long. It's sealed, but not pressurized. The cargo compartment also includes a non-structural HDPE or BNNT liner to attenuate radiation from SPE's and GCR's. The intent is to provide a radiation shielded storage space for consumables (food, water, and oxygen tanks), spare batteries, spare parts, solar arrays, CO2 cylinders for air tools, or sensitive scientific instruments. There would be cargo tie-downs and nets for securing cargo. This vehicle is equipped with a sophisticated FLIR system to identify obstacles in low visibility, like the DAS in the F-35 fighter. This vehicle is equipped with kevlar tow ropes and glacis plate eyelets to tow terrain-disabled vehicles. External life support connections provide oxygen for vehicle maintenance and setup of scientific equipment like weather stations. A manually operated hoist or dozer blade may be optionally fitted to this vehicle for construction activities in one of four locations at the corners of the cargo box. The dozer blade only attaches to the front of the vehicle, if that's not clear. I meant to indicate that the hoist can occupy one of four sockets for lifting heavy objects near the vehicle. For extended duration operations, Orbital ATK solar arrays can be mounted to the top of the vehicle in four sockets that the hoist occupies when mounted. Each array is rated to provide 300We. The arrays are the exact same arrays mounted to the Mars Insight lander. Four arrays can provide a maximum output of 1.2kWe. Ordinarily, the arrays are stored in the cargo compartment and manually deployed when the vehicle stops to conduct scientific experiments away from the base. These arrays provide enough power for life support and a slow recharge of the batteries. If more power is required, then additional arrays may be carried and deployed on the ground around the vehicle. For extended duration operations, spare track links, road wheels, and drive sprockets can be affixed to the exterior of the vehicle. An open top cargo bed version of this same vehicle could serve as a Martian pickup truck for hauling regolith around the base and the four sockets for hoist attachment would serve as the mounting points for a regolith loading bucket for general purpose earth moving activities. At that point, we just have a Bobcat / truck designed for use on Mars. The movement is the conversion to torque at RPM and direct drive means more HP...When you choose torque, this calculator will measure the approximate torque of an engine based on the horsepower, multiplied by 5,252 (conversion between foot-pounds and horsepower), divided by the RPM of the engine. Battery information indicates 3.5 years later charge capacity are greatly reduced in what they can store for energy. The Leaf uses an 80 kW (110 hp) and 280 N⋅m (210 ft⋅lb) front-mounted synchronous electric motor driving the front axle, powered by a 24 kWh lithium ion battery pack rated to deliver up to 90 kW (120 hp) power. Avoid exposing a vehicle to ambient temperatures above 120 °F (49 °C) for over 24 hours. Avoid storing a vehicle in temperatures below −13 °F (−25 °C) for over 7 days. Avoid exceeding 70% to 80% state of charge when using frequent (more than once per week) fast or quick charging. Allow the battery charge to go below 80% before charging. Avoid leaving the vehicle for over 14 days where the Li-ion battery available charge gauge reaches a zero or near zero (state of charge). The Japanese Type 60 weighs 17,600lbs (8,000kg) on Earth. That's a loaded weight. The vehicle's empty weight is 16,720lbs (7,600kg). Its Komatsu Diesel engine outputs a maximum of 150hp. Therefore, brake horsepower per metric ton is 18.75. The vehicle I propose weighs 8,800lbs (4,000kg) on Earth, but only 3,300lbs (1,500kg) on Mars. Its pair of electric motors output a maximum of 29.5hp (22kW). Therefore, brake horsepower per metric ton is 19.67. That's why I said it's slightly better, but only just. Part of the reason for the spectacular weight difference is the chassis material used and material thicknesses. We're not trying to armor the vehicle to provide ballistic protection. The chassis must be stiff and light. It's not a tank. It's just a cargo carrier. The Type 60 can climb a 60% gradient on Earth, so I presume a vehicle with a slightly better power-to-weight ratio on Mars will have similar performance. The electric motors will be low-RPM, high-torque. When I said direct drive, I should have said no transmission. I meant that the motors are directly driving the drive sprockets. The motors will definitely have a final drive gearing ratio, as all electric vehicles do. I do agree that a gear box is required to match the torque/rpm of the motor to the drive wheels of the track assembly outputing transforming ratio such that the wheels/track turn at low rpm with the higher torque as provide by the gear ratio. Just the same but opposite reason for all the gears on the 18 speed pedal bike. It may make sense to use more powerful motors than necessary, but the total output utilized doesn't need to be any higher than what I stated to get the kind of performance that the Earth bound vehicle is capable of. I could see higher output being useful for better acceleration, but the running gear limits the performance of the system. Then again its the match of the pulsing controller that sends the power to each coil in sucsession that makes inductive and Permanent magnet motors move at the rate to which we want under the load we have at the time we are on mars. Of course we will need to be able to trouble shot what will be a cause for a motor malfunction as to whether its in the coils or in the driver curcuit that we use. Here are some websites you can use to gather information that you will need to start building your next e-bike or other small projects such as the redu or the lunar rover. Multiple switching per phase will help to approximate a sinusoidal voltage curve and reduce harmonics to a more acceptable level. A single switch per phase will approximate a square wave. This is particularly important on systems supplying more consumers than power to just one motor. The harmonic components of the voltage contribute no useful power, but will cause a lot of heating, sometimes in surprising areas of the power system that happen to resonate. Depending on the motor type the circuits used will differ. The motor winding must also be considered for what to use for the driving circuitry as motors can be wound in a Delta configuration when 2 or more phase windings are created and to a common connection for the WYE winding methods which can be way more phases than Delta configuration which is usually 3 phase. The voltage circuit wave shapes can be as much a part of the driver components to the type of motor that we are trying to match up for the highest possible efficiency. Even a DC motor can be fed an AC signal and it will run depending on the wave form supplied. With sinewave drivers these are more like an amplifier stage while trapezoid is a mix of ramps and square waves to connect the hard on conditions with pure square waves can swing in both directions about a return value or be single ended power source driving in only one pulsing direction. The drivers can also be arranged in push pull and bridge mode as well to supply the voltage and circuit to the motor. The throw in some sensing of position and indexing of rotation with hall effects or other proximity of a magnetic field and we can control the motors stepping functions of speed. 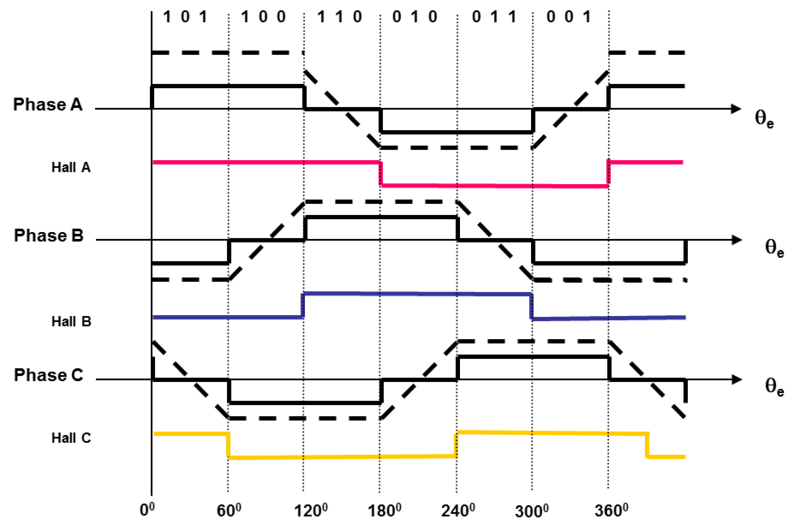 This is the sinewave 3 phase timing of the driver circuit. I have shown that we can build with the simple form of technology the motors or various types. What next would be how to get to the frame from smelting, making of glass, and even the pressure shell construction. The use of the plastics that we will have brought from all the meals sent plus other materials that are in the waste stream will allow for insitu process to begin to allow for expansion via creation and not waiting for cargo of what we want which comes at a cost. Recycling of thermal plastic can help to make many things as we will not be relying on the processing of co2 + H2O in order to make the plastics that we will need. A large problem on earth is the effect of exposure to atmospheric oxygen of recycled plastics. They are significantly degraded relative to virgin material. This is easily avoided on Mars for all outside uses. However, the other great enemy of plastics is much worse there- UV light. I doubt that recycling plastics as such is going to give great results on Mars. Perhaps breaking them down to their monomers and repolymerising will be the better option. Of course there are coatings that would be reflective of UV and we could paint in time as well but one other method would be to spray aluminum metalized coating simular to the mylar balloons onto the surface. The key with growth is to use the lowest energy and resources from insitu as possible. Which would make the recycling and reuse something to take a good look at. Thanks for the link. I'm a fan of the drill robots. It's the only way we'll ever learn whether or not Mars still has life and probably also the only realistic way to get the water required to make enough propellant for return to Earth. I would think that we could send a couple ton mission to the surface with current technology and of course mobile or not we do need nuclear power to be able to get the most out of the funds used to go to do the work to explore mars for the insitu resources that a manned mission needs. There's no hard requirement for nuclear power, but you do need a serious solar panel system if that's what you're relying on. The space agencies love nuclear power because it provides predictable output in a volumetrically small package. Mars 2020 will carry MOXIE with it. The first ISRU step on Mars is to obtain O2 for breathing. I would also include an experiment to obtain water from Martian regolith, but that's just me. Additionally, the first helicopter drone is going to Mars with it. A high speed scout with an eagle's vantage point will prove vital to more involved exploration in later missions. A solar powered long endurance drone would be nice, too, but even making model airplanes fly on Mars is difficult. Carrying a 4 m x 4 m or even a 2 m x 2 m flat solar array on a 1 m sq rover is not going to cut it as it would be quite ackward for moving it around like a roof over it but maybe a pole tracked fan panel might be better from ATK as we need lots of power. You have to realize that NASA is not a monolithic organization all of one mind. No government agency is. There is an unmanned probe community within NASA that wants to keep on doing what they've been doing, mostly wildly successfully. They get most of the Mars-related budget, because of the way an incompetent Congress makes priority decisions and micromanages the agency. The manned spaceflight portion of NASA would like to see a probe that verifies resources and demonstrates ISRU/ISPP stuff, but they are mostly now focused on going back to the moon, since that's what the administration seems to want. Whether Congress will actually fund the boondoggle of a station around the moon (instead of one on the moon that makes real sense) is as yet undetermined, but the track record of the last 40 years is not very encouraging: most of it really is boondoggle after boondoggle, for political pork purposes. Build it like the lunar rover: a big battery and an electric motor. Make the battery a rechargeable one. Plug it in to the base's power system at night to recharge. Just don't make the mistake of putting aluminum tires on the wheels! That was one stupid design mistake they made with Curiosity! When you drag steel over rocks, the rocks eventually win. If aluminum, the rocks win very quickly. Anyone who has ever done construction industry dirt work, or farming, could have told them. Arrogant fools. They didn't ask, and would not have listened if they had asked. That power system probably ought to be a combination of nuclear and solar. If you are making propellants during the day, you will need significantly more power during the day, just when solar is usually available. Think of it as solar superposed over a night-time base load supplied by nuclear. Then you don't need so many tons of batteries for your solar portion. "KISS". I presume they chose metal for the wheels because rubber would fracture in cyrogenic temperatures...What material would you recommend? I don't know whether this distinction has been made, but I would differentiate between a large explorer rover (or large robot long range rover transporter) and a base rover. The latter I think could be all-electric. Initially the longer range explorer rovers would probably need to be a mix of electric and some other power source. I favour methane/oxygen drive for the other source. I have previously argued for the way station approach for exploration and fuelling, so you set up way stations with solar powered charger batteries, food, water and compressed air every few kms (probably something like 10 kms would be convenient). These would be replenished where necessary by dedicated crews. NASA is currently working with shape-memory metal alloys to limit the damage done by driving over sharp rocks. That actually works fairly well. A conventional rubber wheel would work if it could be kept heated using a radioisotope heating unit (RHU) and a highly efficient heat spreading material like a carbon sheet embedded inside the tire and/or woven into the tread of the tire. That's the closest we could come to a rubber tire that would work anywhere on Mars, irrespective of temperature. There is also the Thoraeus metallic rubber compound (extremely tough stuff, as rubber goes) that can withstand cryogenic temperatures without a heat source and remain above its glass transition (Tg) temperature. I've posted about that in some other thread here. No idea which one. Use the search feature. As far as motive power is concerned, internal combustion engines are still king of the hill because of the energy content of their fuel. However, electrics are king of the hill as far as ultimate efficiency goes, especially at the low speeds required. There won't be any dune buggy racing on Mars, so this is fine as long as adequate electrical power can be stored. There aren't any gas stations on Mars, nor does there need to be to travel away from the base. A longer-ranged machine could still use solar sails (vertically strung solar panels) on account of how thin and light the thin film technology is and the lack of atmospheric resistance, but it would need to be stabilized during travel to prevent damaging the array. An internal combustion engine would be most practical when its used near its fuel source because there's zero infrastructure on Mars, apart from what we take with us. In light of that fact, a combined solar and nuclear (electric, really) solution is the best way to go for greater endurance. The potential for an explosion from volatile oxidizer / fuel combinations should not be dismissed, either. I was wondering if we could design a near diesel engine with fuel supply injectors using hydrogel fuels? Granted it would be better not to need to take this fuel with us but in the future I would hope that we could make it insitu. Then the solar panels would be to power the general lifesupport and other needs for such a rover.